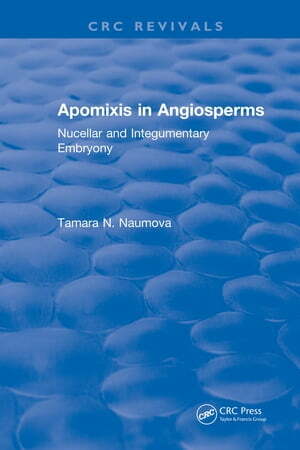 Collins Booksellers - Apomixis in Angiosperms by Tamara N. Naumova, 9781351086653. Buy this book online. Apomixis in Angiosperms: Nucellar and Integumentary Embryony is based on original cytoembryological data and critically reviewed literature on more than 250 species from 57 families of angiosperms. The book covers the complete process of nucellar and integumentary embryo formation and viable seed development within species, families, and among angiosperms in general. Many species (some of which are economically important) characterized by adventive embryony are listed. The book also provides an original simple classification of apomixis and offers a new approach to differentiating embryological structures in cases of apomixis and amphimixis. Apomixis in Angiosperms: Nucellar and Integumentary Embryony will be a useful reference for embryologists, botanists, cytologists, geneticists, and plant breeders. It will also benefit any researcher interested in studying somatic embryo formation in tissue culture.